Did Superman meet Lois Lane for the first time at a teen summer camp? 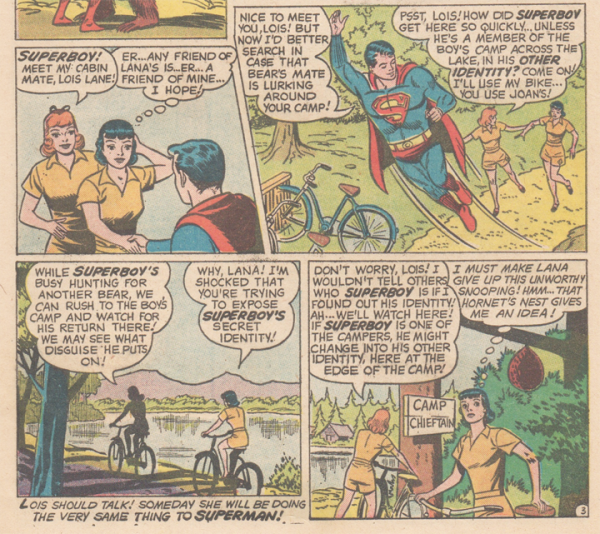 SMA Teen Summer Camp Fun Fact of the Day: YES, Superman did meet Lois Lane for the first time at a teen summer camp! In the 76 years since she was first introduced as a character,Lois Lane has been the primary love interest of Superman in the comics, movies and television shows based on the superhero. In fact, when you think of superhero love interests, she’s likely the first who comes to mind. What you may not know is that long before she was an award-winning journalist trying to reveal Superman’s identity, she helped protect Superboy’s secret after they met for the first time at a teen summer camp. The backstory of their first meeting is told in the June 1959 issue of Adventure Comics (No. 261). Lois goes to Teen Camp Hiawatha and Clark Kent happens to be at the nearby boys’ teen camp, Camp Chieftain, close enough to hear a bear attack at the girls’ camp. 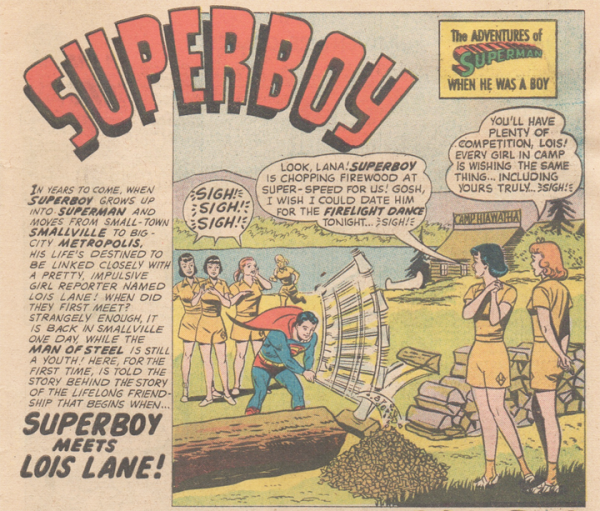 After throwing the bear a mile away – “my super-aim will see that you land unhurt in a hay-field” – Superboy is formally introduced to Lois Lane for the first time by her friend and cabin-mate Lana Lang. Lana is determined to find out which Camp Chieftain camper is Superboy, but each time she hatches a scheme she’s sure will work Lois foils it by doing things like knocking over a hornet’s nest when Lana suggests they hide out near the boys’ teen camp to see what camper comes rushing back after taking care of the bear or intentionally knocking over a box with a boy’s collection of frogs and other small animals when Lana sneaks into the boys’ cabin to search for what camper might be hiding Superboy’s supersuit. After calling on Kryptodog to save Lois and Lana from being “stuck” in a cave and therefore foiling another of Lana’s schemes, Superboy sets a date with Lois to the Firelight Dance. Figuring it serves Lana right for her attempts to reveal his identity, Superboy changes his mind about Lana when she finds a piece of kryptonite on a nature hike and pushes it down into Echo Canyon out of harm’s way. The rolling meteor puts Lana in danger instead when it causes a landslide, but Superboy sweeps in to the rescue and asks Lana if he can take her to the Fireflight Dance. Naturally, when the girls figure out they are both going to the dance with the super two-timer, they get angry and decide to do some female bonding, taking a canoe trip that almost becomes deadly. Thrown from the canoe in rough waters, Lois requires an iron lung after nearly drowning, prompting Superboy to build one out of scrap metal at a nearby junkyard. Once reunited after Superboy saves her life, Lois and Lana discover that they both have poison ivy, which of course Superboy already knew. Who new that Superman first met Louis Lane at a Teen Summer Camp.